Multi-stage operation responds to changing conditions so the 16HPX adjusts to maximize energy savings—operating at lower speed most of the time, and ramping up during periods of increased cooling demand. Humidity control when you pair your heat pump with a variable-speed furnace or air handler to continuously maintain a slow circulation of air throughout your home, decreasing the amount of humidity in your home for improved indoor air quality and comfort. 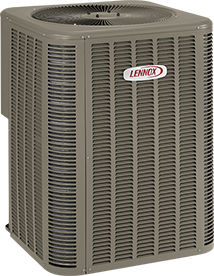 Dual-fuel compatible when the 16HPX is installed with a compatible Lennox furnace, it creates a heating system that can switch back and forth between electricity and gas automatically, based on whichever is most cost-efficient for the weather conditions at the time. Efficiency ratings of up to 17.00 SEER and 9.50 HSPF, packing a lot of comfort into an affordable package.